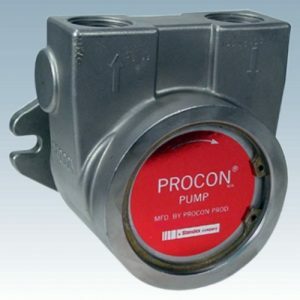 Procon pumps are a rotary vane pump suitable for a variety of applications. Applications including Carbonated water for soft drink dispensers, Espresso coffee machines, Beer cooling systems, cooling for TIG Welders, Reverse Osmosis systems and their are a lots more uses for the Procon pump. Procon is the industry leader in rotary vane pumps. Procon is the brand used in most post-mix machines, There are many different brands of rotary vane pumps on the market. Many are just as good and many a lot cheaper than the procon pump brand. What are Procon pumps used for in post mix machines? Post mix machines come with between 1 – 3 procon pumps somewhere in them. Most post mix machines use a procon pump to boost water pressure to the carbonator that makes the soda water, this pump is essential in post mix machines. Many machines also have a second procon pump for soda re circulation this pump. This continuously circles the soda water from the guns to the machine keeping the soda cold and fresh. A re circulation is pump is required in machines where the dispensing point (gun or tower) is further away from the soda generator then about 1 metre. Some post mix machine also has a third procon pump that recirculates plain water, keeping the water cold. Generally there are two types procon pump on post mix machines brass or stainless steel. 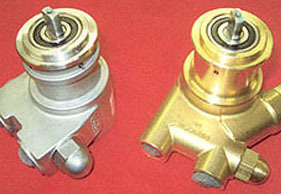 Stainless steel pumps can be used anywhere in the machine but are generally more expensive. 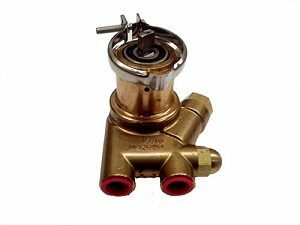 Brass bumps can only be used for plain water i.e on the booster pump for the carbonator and for the plain water recirculation. Brass pumps cannot be used for soda recirculation as exposure to carbon dioxide (the gas post mix machine use) will create carbonic acid. Carbonic acid not only tastes extremely bad but is poisonous to drink. 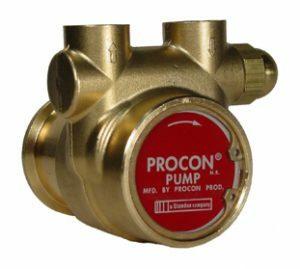 How do I tell if my procon pump is not working. This pump is used to boost the water pressure going into the carbonator tank, if this pump is not working generally you will just get gas with a trickle of liquid coming out of the dispenser Point. This pump is not meant to run continuously. If this pump is not working usually you will find that the pump is running continuously trying to boost water pressure unsuccessfully. Another good indication is if it is warm to the touch as this pump should be room temperature. This pump runs continuously, always sending soda water through your system to your dispensers then back to the machine to be re chilled. If this pump isn’t working you will generally find that your soft drinks are warm and flat. To check whether this pump is working most systems have a flow strainer installed close to the outlet side of this pump. You can tell if this pump is working by looking at the ball if it is pushed back against the spring it is working, you can turn the machine off and on to see if the balls position moves. Another good way to test is by the temperature of the pump, this pump should be cold. This pump is circulating cold soda at about 2 degrees centigrade so the pump should be very cold to the touch. If it is room temperature or hot, then it is not working. This pump runs continuously, always sending water through your system to your dispensers then back to the machine to be re chilled. This pump isn’t working you will generally find that your water is room temperature or just a bit colder. See if this pump is working by looking at the ball, if it is pushed back against the spring it is working. When you turn the machine off and on to see if the balls position moves. Another good way to test is by the temperature of the pump, this pump should be cold. This pump is circulating cold water at about 2 degrees centigrade so the pump should be very cold to the touch. If it is room temperature or hot then it is not working. This pump is also not essential for good running of soft drinks and you can just serve your orange juice or water with ice. 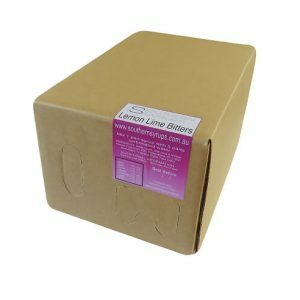 Many people choose this option as these pumps can be expensive to replace. (1) You need to depressurizing your system before attempting to replace these pumps. To do this turn machine off at the PowerPoint. Turn off the water and turn off the gas at the gas bottle. (2) Now hold down the water and soda water buttons until everything has stopped coming out. (3) Locate the pump you wish to change. On it you will see two lines and Inlet line and an outlet line. Generally there will be an arrow on the pump itself showing up or down for each line. (4) Remove these lines. 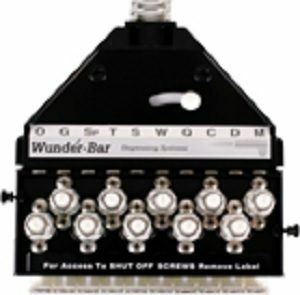 Simply unscrew them using two sifters 1 on the pump and 1 on the fitting attach to the line. (Marking each line so you remember which is the inlet and which is the outlet). (5) Now the inlet and outlet lines have been removed you will see that the pump is attached to the motor. With a single clamp that is held in place with a single screw. Using a screwdriver loosen the clamp and remove the pump. (6) Now on the pump there is a (key) Going between the pump and the motor. Careful not to lose this key as you will need it. (7) Put the key into the new pump and attach it to the motor, locking it in place with the clamp. (8) Reattach the inlet and outlet hoses, making sure they are tight (they may need plumbers tape to get a tight seal). Texmix 25 – Easy install kit Setup.